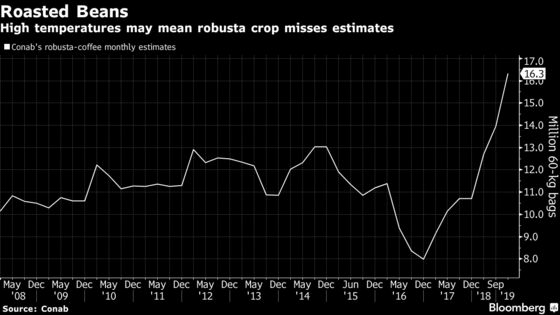 (Bloomberg) -- Farmers just can’t catch a break with the weather right now. While a cold snap threatens winter crops in the U.S., scorching temperatures are imperiling Brazil’s prospects of a record robusta-coffee harvest. The normally sturdy robusta beans -- used in instant coffee and espresso -- are roasting even before being picked amid unrelenting heat in the states of Espirito Santo and Bahia. Maximum temperatures this month are as many as 8 degrees Celsius (14 degrees Fahrenheit) above average in the main producing states, according to Somar Meteorologia. “Beans are being burned amid scorching conditions and lack of rain,” Edimilson Calegari, general manager at Brazil’s top robusta cooperative Cooabriel, said by telephone from Sao Gabriel da Palha in northern Espirito Santo. 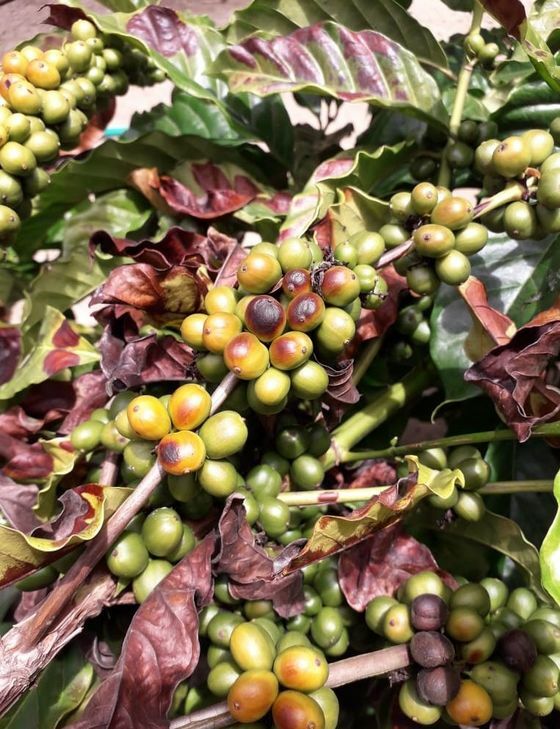 Under consecutive days of high temperatures, the side of the coffee cherry that is exposed to the sun dehydrates, preventing the bean inside from forming properly, Calegari said. After abundant rain in the second half of last year that boosted optimism for the crop, robusta-coffee areas in Espirito Santo got only 5 millimeters (0.2 inch) in January, trailing the 150-millimeter average for the month, according to Somar. "In Bahia, crop conditions are terrible as they don’t have irrigation to ease plant stress," Cooabriel’s Calegari said. Before the heatwave, the Brazilian robusta-coffee harvest was expected to reach records, rebounding from a severe drought in 2016. Crop agency Conab estimated the nation’s coffee crop at as much as 54.5 million bags, 16.3 million bags from robusta beans.